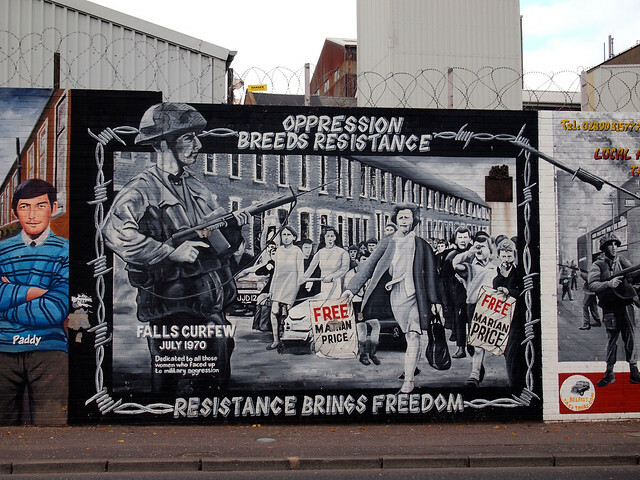 As I stand in front of the International Wall in Belfast, topped with barbed wire and splashed with political murals, I can't help feeling like I've seen it before. Like I've stood here before. 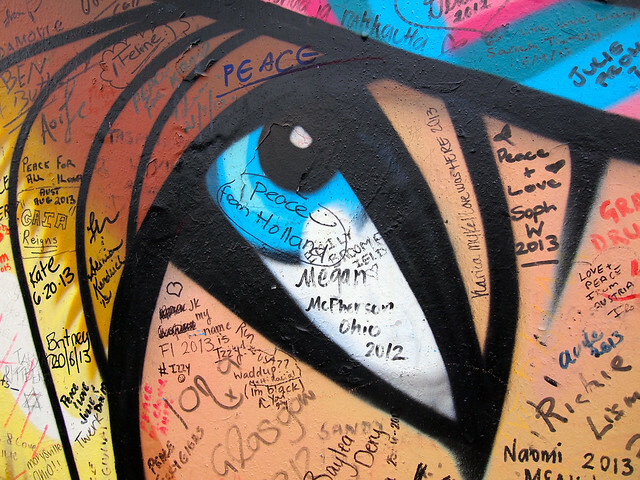 And yet, when I stood in front of the colorful murals at Berlin's East Side Gallery – painted on a still-standing section of the now-defunct Berlin Wall – I stood there with the knowledge that that part of Berlin's past was behind it. That part of the wall stands now only as a symbol; a reminder of how things used to be. In Belfast, however? 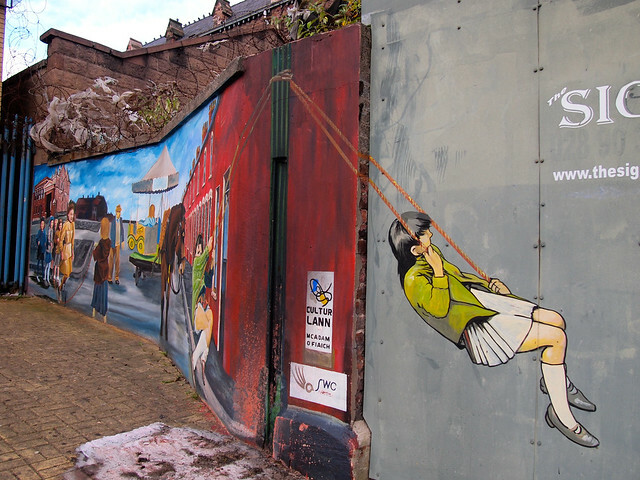 The walls and gates scattered throughout the city of Belfast are still there to serve a purpose. I walk up to a closed-up gate; it's a Saturday afternoon, and my Black Taxi driver/guide Brian explains to me that all the gates in the city close to traffic at nights and on weekends. 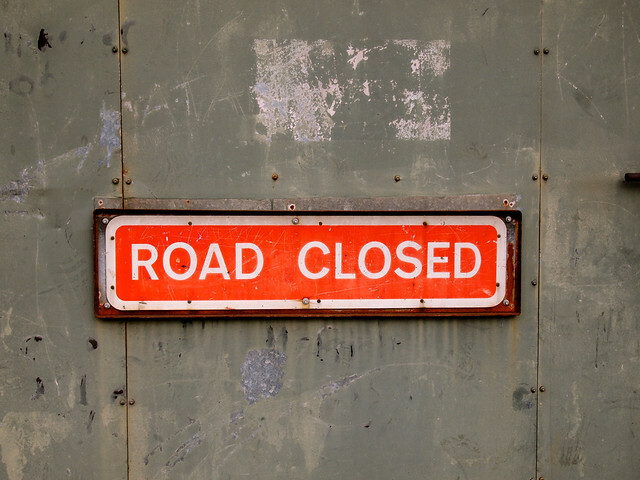 Unlike in Berlin during the Cold War days, however, this doesn't mean that you can't cross from one side of the city to the “other.” It just simply means you have to make a detour; take a slightly longer route. “It started when I was 9,” Brian says. He's referring to what the wider world would eventually come to refer to as “The Troubles” — politically-driven violence in Belfast that would stretch over a span of nearly 30 years and claim more than 3,600 lives. Most historians will tell you that The Troubles were not a religious conflict. They will say that it all began in the late 1960s with the Loyalists/Unionists arguing with the Republicans/Nationalists about whether or not to stay a part of the United Kingdom, or to join the free state of Ireland. And it's true that a big part of the conflict was based around this question of national identity. But tied to this national identity was the matter of religion — most of the Loyalists were Protestant, and most of the Republicans Catholic. From the 1920s right on through the 1960s, Catholics in Northern Ireland were essentially treated as second-class citizens. They were not allowed to vote, and could only hold menial jobs no matter how great their skills/knowledge were. In 1964, a (peaceful) civil rights movement was begun by the Nationalists seeking to put an end to the discrimination of Catholics in Northern Ireland. It only took a few years, however, for things to turn violent. 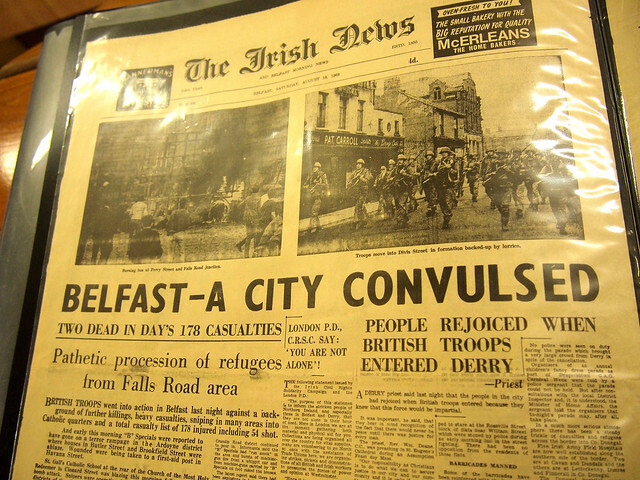 By August of 1969, riots were breaking out across the country, Loyalists and Republicans were clashing physically, Catholics were being burned out of their homes, and the British military was called in to put an end to it all. By the time 1970 rolled around, Belfast's now-iconic black cabs began operating due to the collapse of the city's public transportation. For decades, the cabs were just that — a means of transportation around a divided and warring city. Today, however, the cab drivers also give historical tours around Belfast, sharing their memories of The Troubles. 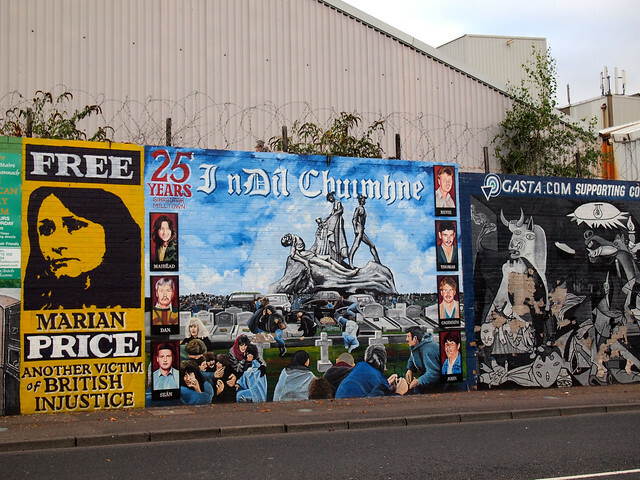 While a ceasefire was enacted in Belfast in 1994 and the “Good Friday” Agreement signed by both sides in 1998, tensions still exist in the city. Between 50 and 80 walls, fences, and gates still remain in place, separating one “side” from the other. Some have been reinforced and made taller just in the past decade. 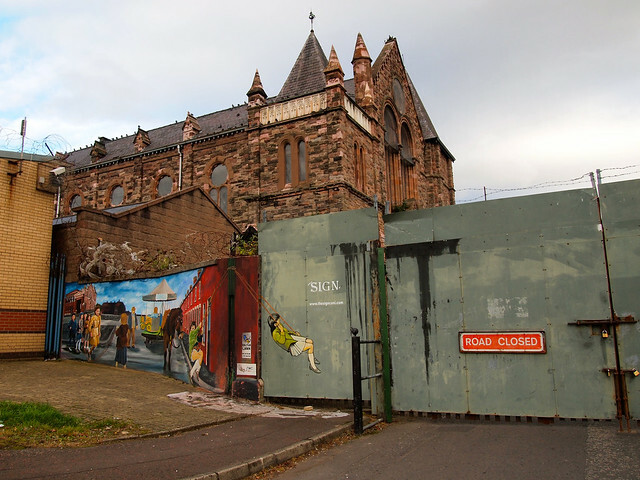 While Brian explains that most Catholics in Belfast feel that they are better off now than they were 20 years ago – there's now a shared government and religiously integrated schools, for example – The Troubles have by no means disappeared completely. Homes near the walls still have to have metal grills or steel cages around their windows to guard against the rocks and bottles that are still frequently tossed over. Half of the city still displays the Union Jack, while the other flies the Irish tricolor flag. And, when new public housing is built in the city, Brian says it is still built with a separating wall. Again: there may be a semblance of peace here now, but it's not over yet. We drive around the city for nearly two hours, stopping at a small museum, a church, and various large “memorial” murals dedicated to everyone from innocent victims to assassins-for-hire. 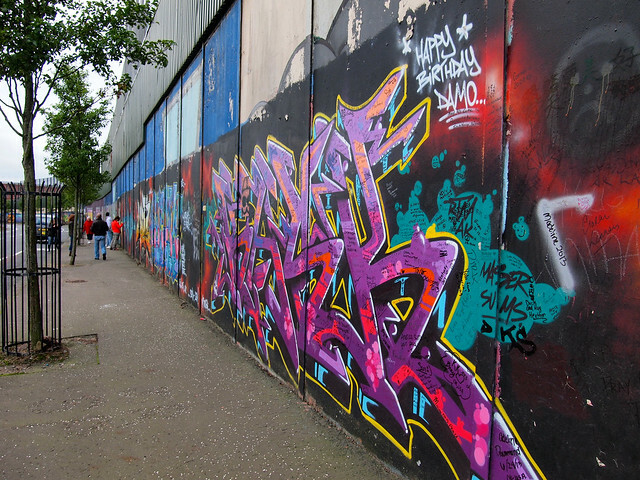 We stop at the International Wall, as well as another, taller, wall covered in graffiti that separates the Catholic Falls Road from the Protestant Shankhill Road. Again, I can't help being reminded of Berlin. Just like in Berlin, I try to imagine what it must have been like (what it STILL must be like) to grow up in a city like this. It's not all hopeless, however. Brian tells me that the tensions ease up more and more with each passing year. He says that, in the south part of Belfast, the divisions have all but disappeared. And, he says, more and more people are beginning to accept each other regardless of which “side” they come from. Hopefully someday soon the rest of Belfast can become as wise as Brian the Taxi Driver. There are a LOT of Black Taxi companies offering tours around Belfast. I can't speak to any of the other companies, but I went on a tour with West Belfast Mural Tours, and can recommend them as a company that offers informative, balanced tours of both “sides” of Belfast. This was actually booked as a combo tour to Northern Ireland from Dublin through Viator, which also included a trip to Giant's Causeway. Is a political tour like this something you would ever do on your travels? Excellent post! It’s such a tragic yet at the same time still fascinating topic. I first learned about these tours when Anthony Bourdain visited NI. It’s definitely something I’d like to do. I would definitely recommend it! I was interested in Belfast to begin with, but a tour like this really helped me understand it (and even want to learn more). We met a local when in Belfast that said he has never traveled to the Western side of Belfast. A few weeks before we arrived, there was a riot with the sides fighting (it was this year). I can’t imagine living in a divided city either. Hoping it gets better. It’s so crazy to realize that it’s still ongoing, isn’t it? I mean, yes, things have gotten better. But it’s far from “over.” I cannot fathom what it would be like to live there. But I certainly would go back again to try to learn more. Thank you for this post. Northern Ireland is a part of the world I haven’t read in other travel blogs, so it’s more than welcome! Same here, Stefania – that’s why I wanted to go and write about it! My favourite mural was the one of the women marching. I think our tour may have been a bit skewed towards the Nationalists (tour guide was Catholic) but it’s quite horrible to think that segregation like this still happens today. Thankfully, Northern Ireland is on the mend, they’ve started mixed schools and toned down a bit on the violence. Hoping that the wall coming down is something that I will get to see. I hope those walls come down in my lifetime, too. We shall see. 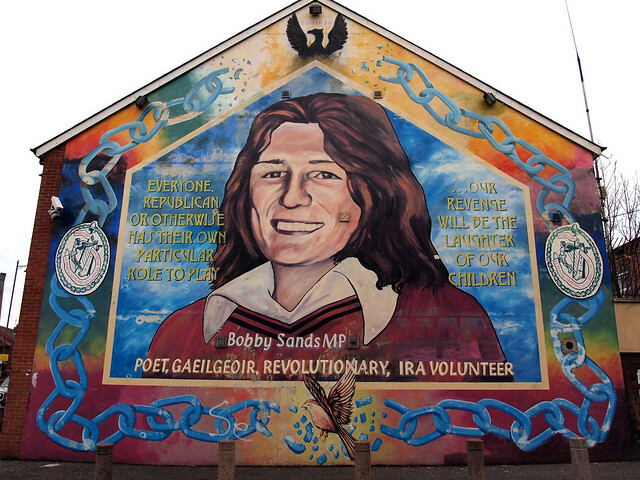 I’ve certainly heard about the Troubles and Bobby Sands, etc. but I never realized that all these walls are still up and still being built to separate the city. It must have been such an interesting tour. It was a fascinating tour. Made me want to go read more about what Belfast is like today. Excellent post – I met a man last year who said he had started doing the tours. Could not believe the interest in them because like you say, they assumed it was normal. Yeah! It’s really interesting how used to it the people living there have gotten to it. I’ve never been to Belfast but know all about the troubles, and can see why it can be so easily compared to Berlin. While any conflict is bad, conflict over religion really infuriates and upsets me. Hopefully things will continue to improve in the future. Such a tragic, but fascinating history. Thank you for sharing! Belfast and NI are high on my list to visit. I will most definitely be taking this tour when I make it there! Thank YOU for reading! If you ever make it to Belfast, I highly recommend one of these tours. SO interesting. A lot of people here write that it is so strange to have walls inside a city to separate people but I saw a lot of walls too when I visited the US, Americans call it ‘gated communities’. Hmm, I guess that is true. And those walls also serve as a form of segregation. But people live behind those sorts of “walls” by choice – not because of violence or political upheaval or because someone else is dividing them from others. I highly doubt that people living in gated communities look at those walls negatively… And the people outside? Well I don’t think most of us really care one way or the other, to be honest. As far as national psyche goes, I would definitely say that walls like those in Northern Ireland are worse. My mother cried when I told her I was going to Belfast. She thought I was in danger. I can honestly say that I never once felt that I was in danger while travelling in Northern Ireland. I learned so much about their history and I feel like I get it now. Being there made such a difference. I agree – going there helped me understand it all a lot better. And Northern Ireland is GORGEOUS! I never felt in danger, either, and definitely would like to go back again sometime. No worries – I only went up very briefly to see Belfast and visit the Giant’s Causeway since I found myself with some extra days in Dublin! As for the tour, we did visit a lot of things on the Republican side of the walls, but we also went to the Protestant parts and saw some of those murals you mentioned (the tour I took actually focuses on the murals). Sadly, my camera decided to change settings on me, and none of the photos I took in that part of the city turned out! I will say, though, that our driver presented what I felt was a nicely balanced picture of Belfast and The Troubles. He didn’t make any one side out to be “the bad guy.” It’s one of the reasons why I would recommend this tour – I learned a lot! 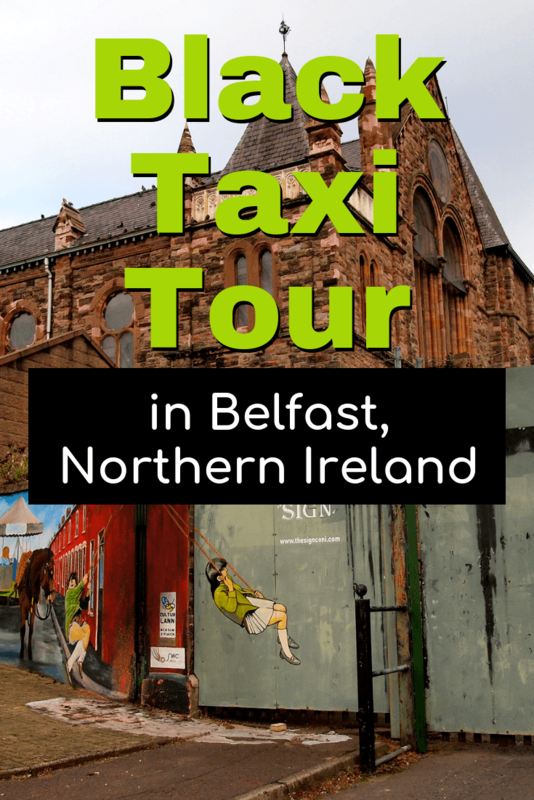 Taking a Black Taxi tour was definitely one of our highlights when we traveled to Belfast and Northern Ireland. The taxi drivers were so open. I agree, if you go to Belfast they are a must. Yup, it’s definitely a must-do. I learned so much. Interesting view point and very informative. can I just say one thing as someone who was born in Northern Ireland that no one should be in the slightest bit put off traveling to N. Ireland today. In comparing the murder rate of Northern Ireland (population of 1.8m) against every city in the US that has a population over 250k, Northern Ireland would rank 72nd out of 74. You can find trouble if you look for it as in any city but the Irish are especially known for their friendliness and their irrepressable spirit. Also it has some of the best open countryside in the world. Just watch Game of Thrones to see some of the countryside. I totally agree with you! Nobody should let this recent history keep them from going to Northern Ireland! I may travel to Belfast in early October this year. Aside from visiting the Titanic Museum and a trip to Giant’s Causeway, I want to sign up for a tour to understand about The Troubles. Am glad that I came across your post on twitter, gonna bookmark this for future reference later in the year. Thanks for sharing ? 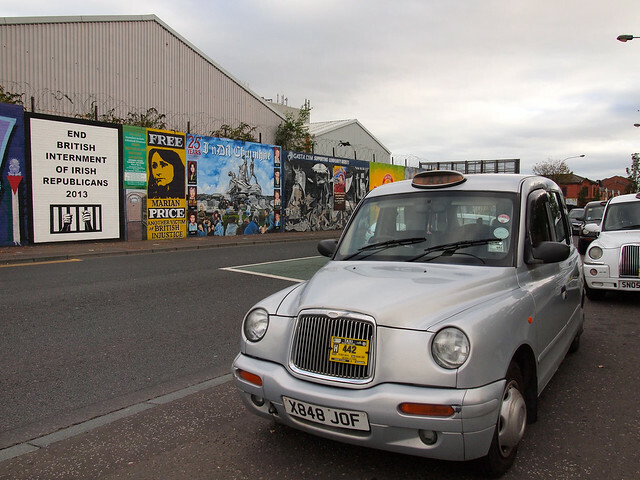 A Black Cab tour of Belfast is definitely worth doing! Glad I could help you out! There are some integrated schools – but you’re right that not all of them are. I certainly hope the wall can come down in my lifetime, but on my most recent visit there, a guide was telling us that a university group did a survey of people who live right next to either side of the wall, and 68% of them say they feel safer with it and don’t want it taken down. So yes, they still have a long way to go!